Back in April, the world celebrated the 400th anniversary of the death of William Shakespeare. England, naturally, was awash with events, and on the day itself – April 23rd – BBC Radio 3 devoted an entire day to music programmes from Stratford Upon Avon, Shakespeare’s birthplace, all with a Shakespeare theme. Jazz, orchestral concerts, songs and choruses, chamber works, piano recitals, cinematic and theatrical scores; all presented with a Shakespearean connection, obvious or oblique. 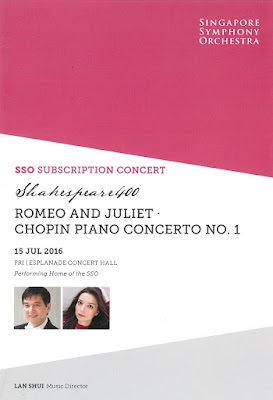 Since then, Shakespeare musical events seemed to have died down a bit, so the Singapore Symphony Orchestra’s new 2016/7 concert season opening with a “Shakespeare 400” series seems to have come somewhat late in the day. A sense of last minute planning has been heightened by programmes with only a peripheral Shakespearean connection, and largely built around a standard-repertory concerto. I took pains in my concert notes for the first programmes in the series to draw Shakespearean links with all the works or composers performed, but the powers-that-be in the SSO chose to expunge these from the printed programme books; so, as far as the audience was concerned, Shakespeare was confined to a single work in last night’s concert. It opened with the wholly un-Shakespearean Vltava from Smetana’s set of tone poems celebrating his native Bohemia. Possibly this was included to acknowledge the SSO’s visit to Prague this Spring, but if Lan Shui and the SSO had picked up any useful interpretative insights from their very brief sojourn on Czech soil, it was not immediately obvious here – unless it was in the rather murky waters implied by some muddy wind playing at the start, a long way from the clear sparkling streams of Smetana’s imagination. Generally the wind seemed not yet to have blown away the cobwebs collected during their summer break and it was not until the violins sailed in with a wonderfully expansive account of the main theme, that the performance began to have some kind of objective. Shui’s approach to this hugely popular score, however, was piecemeal, bumping uneasily from whirlpool to eddy rather than flowing freely over them. He clearly enjoyed the more turbulent moments, but as a whole this was a performance which lacked both coherence and aural polish. A big contrast came with the main work of the programme, Chopin’s First Piano Concerto. It will come as no surprise to readers of this blog that this is not a work I hold particularly dear. I confess to finding its bursts of virtuoso bravura, its tinkling genteelness and its on-the-sleeve sentimentality tiresome. The fact that it seems to get played to distraction in Asia does nothing to endear itself to me. However, while my heart dropped as the SSO launched into that sturdy but unprepossessing orchestral introduction, it lifted the moment Yulianna Avdeeva touched the piano keys. There was something infinitely attractive about her approach. Soothing, gentle and undemonstrative, understating the bravura, injecting iron into the genteelness and giving a steely edge to hints of sentimentality, she left much of the headline emotion outside the hall and simply caressed the piano with grace, unpretentious fluency and consummate command. For once, the Concerto made a bit of musical sense to me, and while I still believe that its length surpasses its musical arguments, I did not find myself wishing – as I usually do - that Chopin could have laid off the continual rehashing of ideas. In subtle ways Avdeeva was developing and enriching these ideas at each appearance in a way which made satisfying musical sense. She did not always get the fullest support from Shui, whose fondness for emotional display often jarred against her studied lack of pathos, and there was a moment in the last movement when an innocuous counter-melody from the cellos wore very thin indeed played, as it was, without a hint of variation over and over again. This was not a performance which focused on sweet sounds and heroic display but began to find something rather more significant within the music. I would need to hear Ms Avdeeva play it again a few times to be sure, but I think I may be on the path to conversion! While many Singaporeans in the concert itself may have been struggling with Prokofiev's “difficult” music for Romeo and Juliet, the only difficulty others of us encountered in yesterday’s seven pickings from the first two orchestral suites was that Shui chose to end with “Tybalt’s Death”, albeit in a scintillating, brilliantly executed performance taken at an absolutely cracking pace and effectively blowing away any remaining cobwebs from the orchestra. What was difficult about this from the listeners’ point of view? We are used to hearing extracts from the work performed in concert and ending on a more reflective note, and to end with such a violent death scene sent us all out in a somewhat ambiguous frame of mind. I missed the raw aggressiveness of the opening dissonant crashes of “Montagues and Capulets”, but the striding theme, underpinned by a powerfully driving percussion section, was truly glorious. And while the more introspective moments of “Madrigal” and “Romeo and Juliet Before Parting” were rather elusive in Shui’s reading, he gave a wonderfully exotic edge to the “Dance of the Antilles Maidens” as well as a real sense of tragedy in “Romeo at Juliet’s Tomb”. Could you share your concert notes drawing Shakespearean links with the works played? Pity the powers-that-be at SSO are such philistines. Those notes would have been far more useful than any pre-concert talk. I am most perplexed. 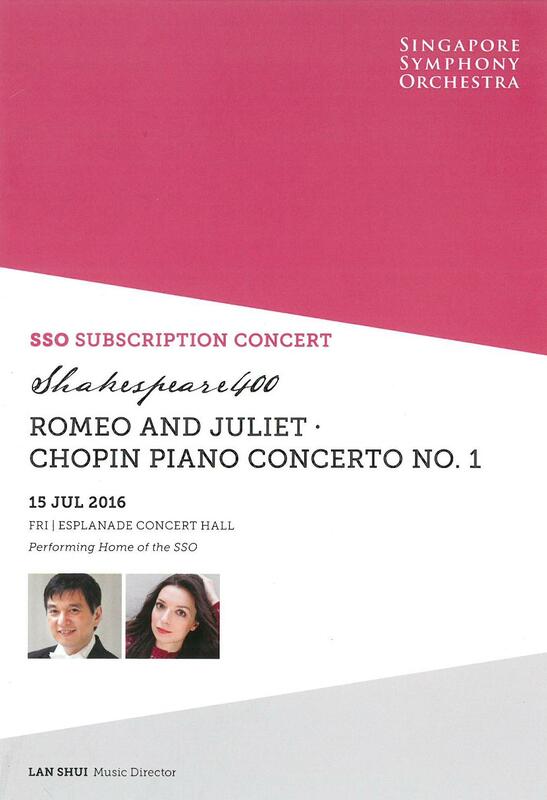 Anyone who read Chang Tou Liang's review of the July 15 Romeo & Juliet/Chopin concert, and Dr Marc's review, would be left clueless as to who to believe. The two reviews are as different as night and day! Indeed, I was wondering if both men even attended the same concert! Frankly, I'd take Dr Marc's review as the truth any day. Reading Mr Chang's review only confirms what I've long suspected. That SSO reviews, unless written by Dr Marc, are mostly Puffery; thinly disguised press releases for substandard performances. Please, Dr Marc, Please tell the truth and shame the devil! I'm all for support of the arts in Singapore, but not less than adequate performances.